micro detail patches are placed in areas to match the same as seen in the photos of the original. 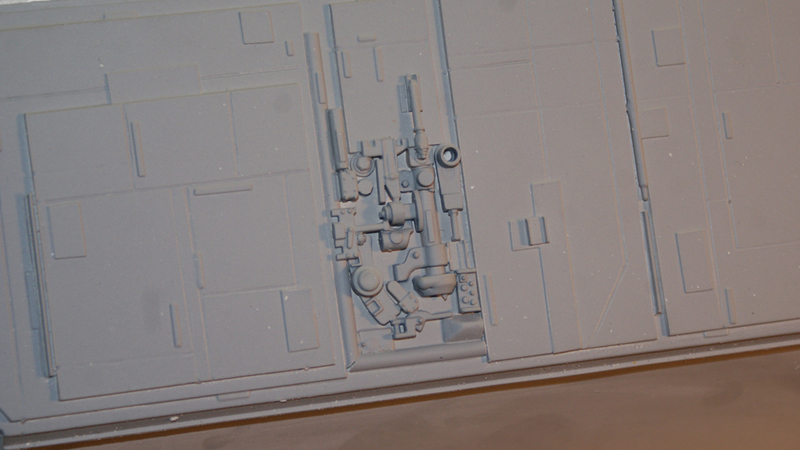 Spaceballs pieces added to the deep detail hidden in the dark recesses here. 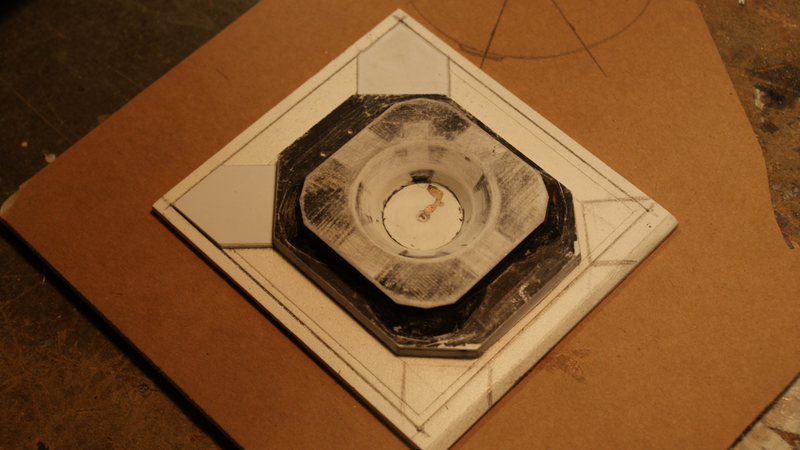 attaching the elements make for one heavy piece!! 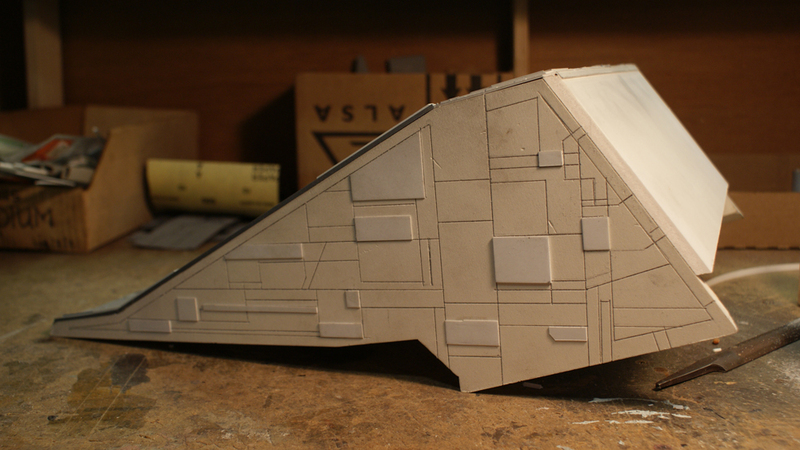 the side view shows the belly module adding a good amount of visual weight to the bridge area! 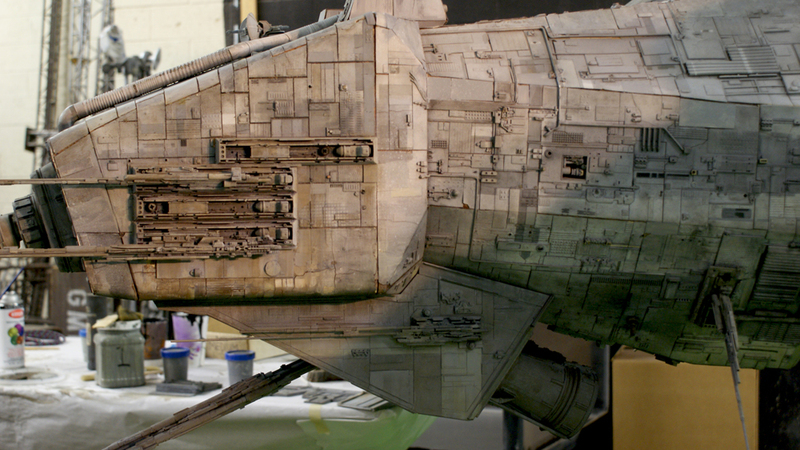 the detail across this ship is so mesmerizing! this thing has so many cool angles to get lost in!!! 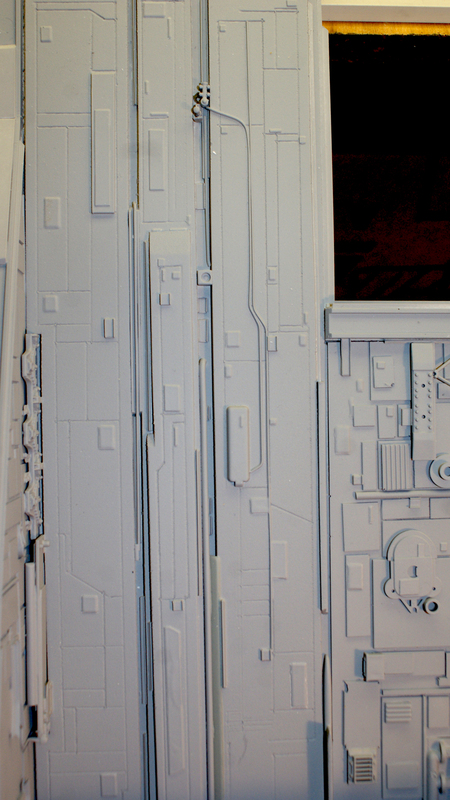 Hi all and so glad to have read all the great comments about the Nostromo!!! 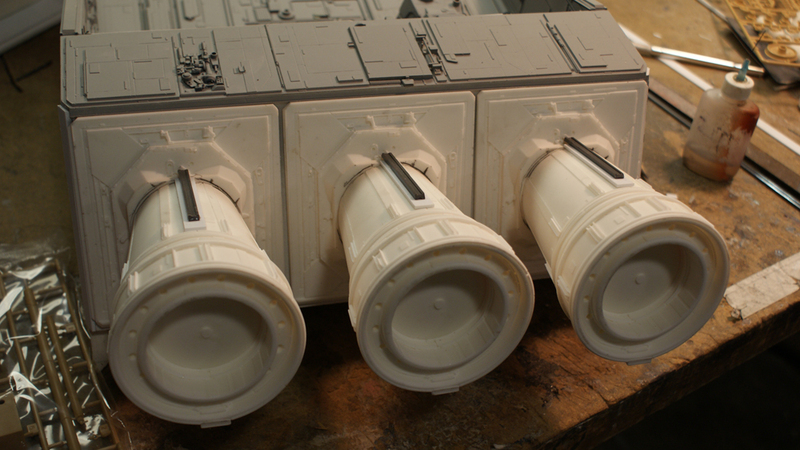 Seems that we all love Ron Cobb and those UK modelers’ massive space tug and are all equally glad that it lives again!!!!!! Today’s entry shows more of the detail construction and some of the set up at the LA Branch of the “Prop Store of London”. 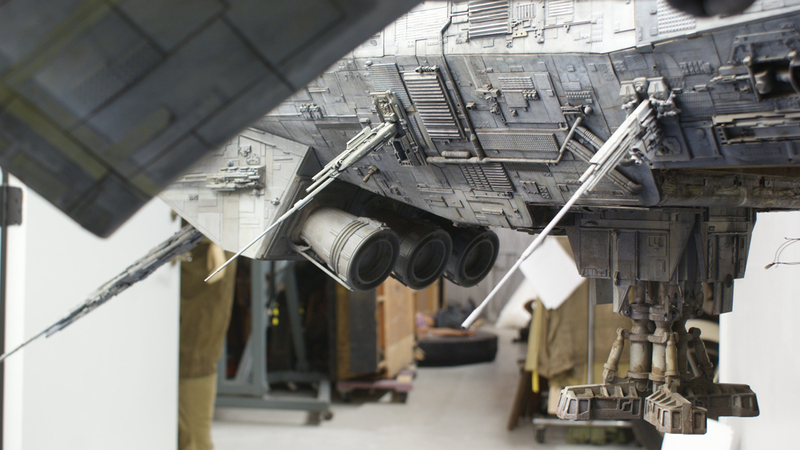 You’ll see all kinds of cool stuff in the background, so there will be more to drag your attention around while looking at the Nostromo. 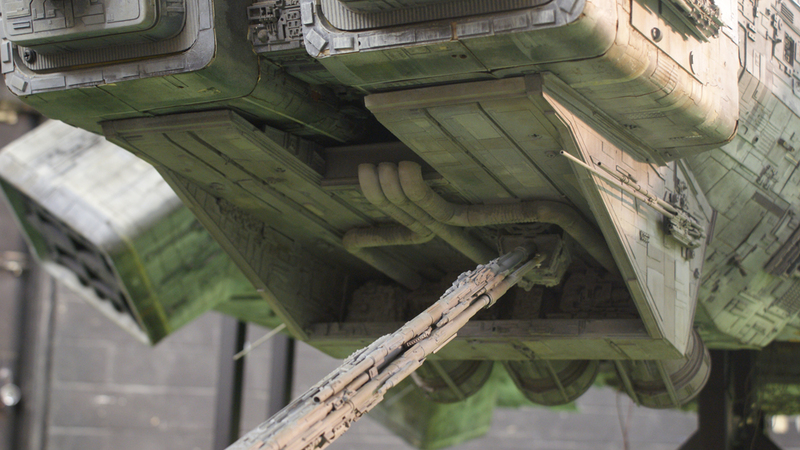 Todays photos start with the construction of the bridge’s belly module… this piece by looks of the paint and detail where it once was, indicates that it was added on much later in the model’s construction. Somebody on stage probably said, “Hey, the nose section is a bit thin!!! Beef it up a bit !! 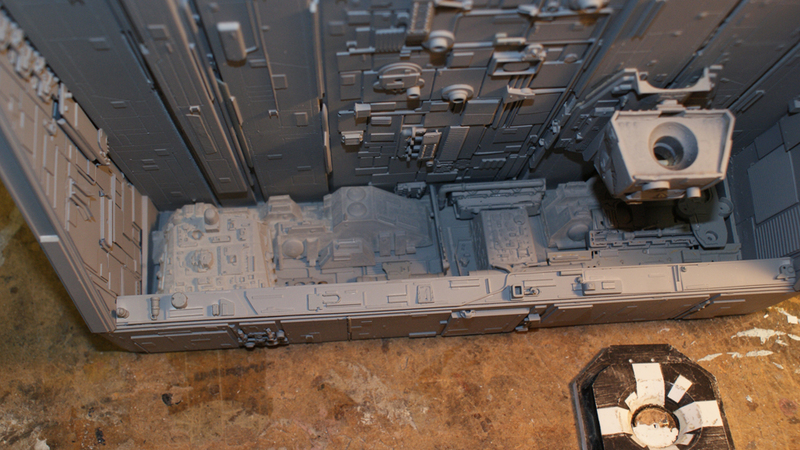 !” And I am sure that is what caused this piece to be built and screwed in on top of tons of lovely surface detail. Anyway, this whole piece was missing, so it had to be built from scratch using the photos at hand!!! 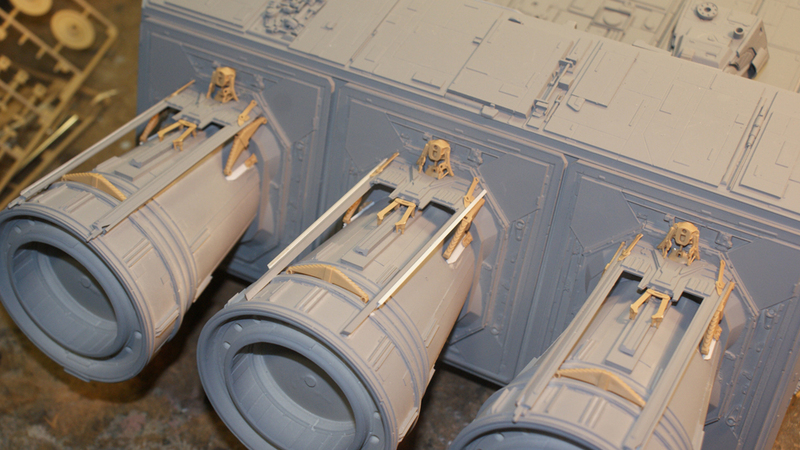 It is basically a fat box with loads of details in the recesses and three nozzles attached to it’s rear. 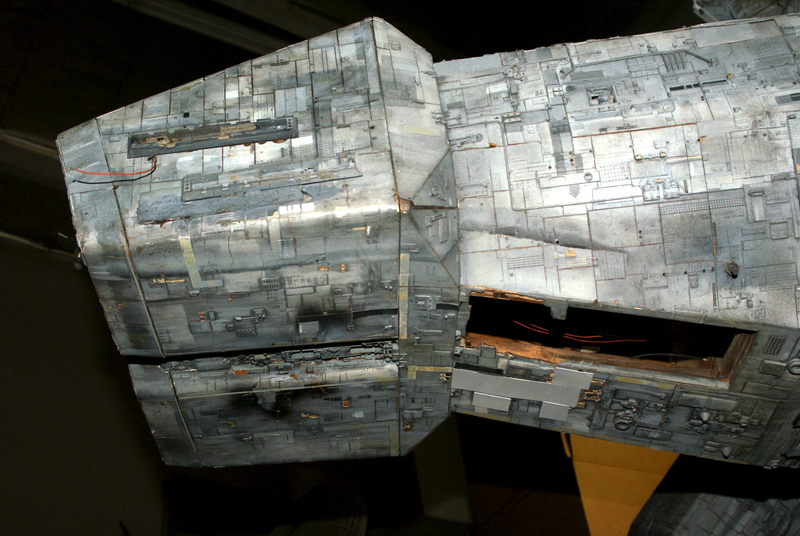 It also houses the massive three foot antenna array which was a bear to mount and keep straight…so with no delays, enjoy today’s Nostromo pics!!! There are also 8 hidden Mickey’s on the ship now!!! but not in today’s pics!! R2 will be the last pic in the last entry for this one. 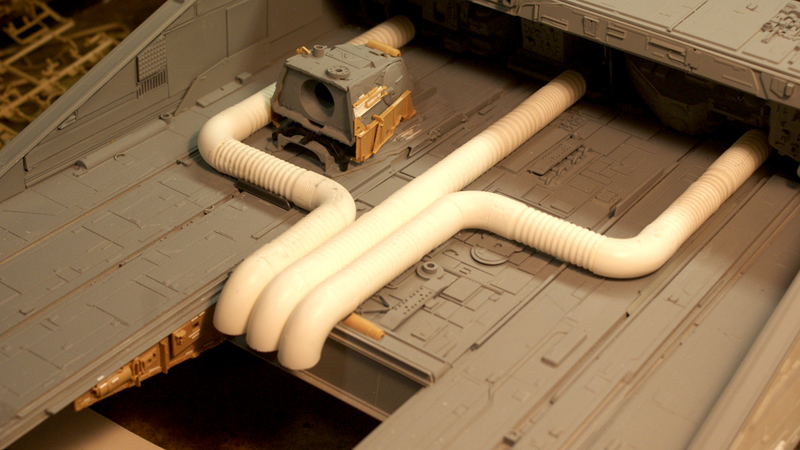 Howdy there and welcome to Nostromo II, the restoration. 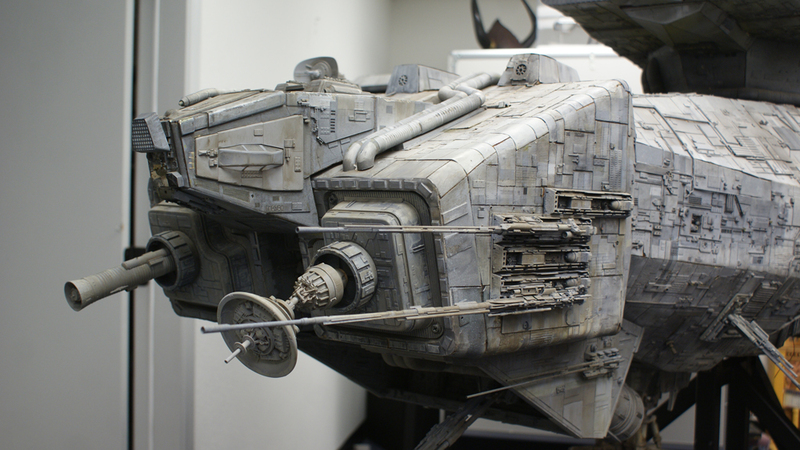 Following the post from a few days ago, here is more on the beloved model from Alien and it’s TLC rebuild. 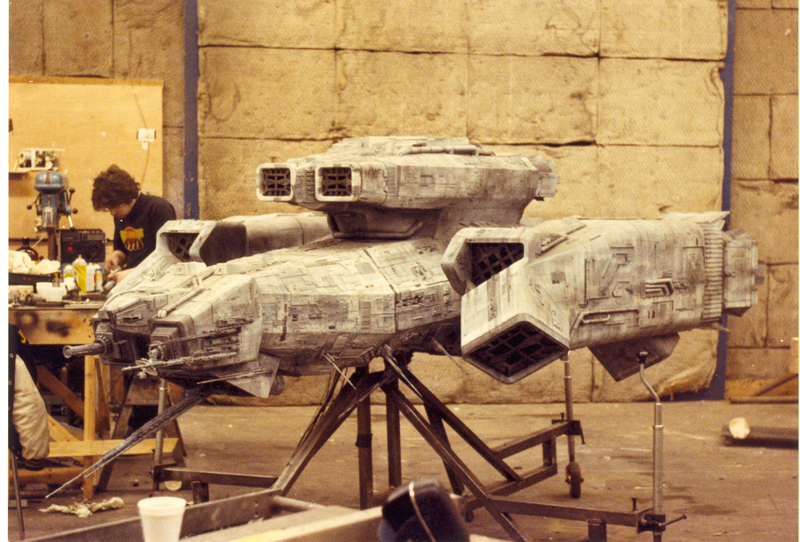 Many months ago I did a special on Martin Bower, and it showcased a lot of his model work on the Nostromo way back in 1978…little did I know, a few shorts months from then I would be seeing this massive model in person and also getting a chance to be a part of the remodeling crew!! 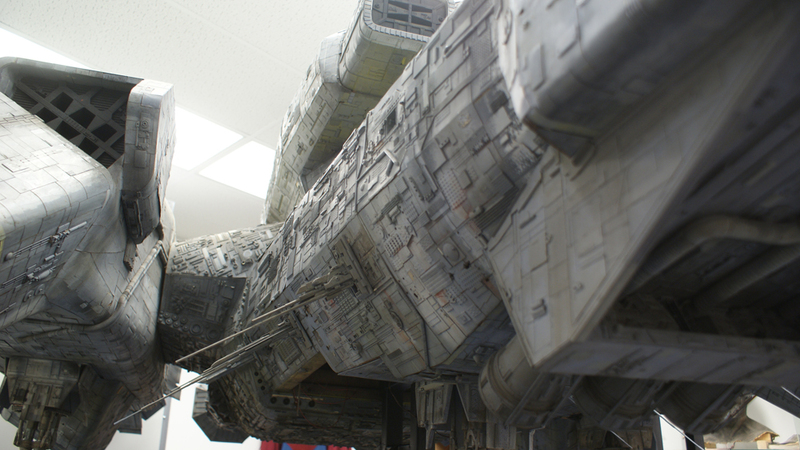 I thought the model was either destroyed or lost in the UK somewhere, and it was quite a surprise to walk in the model shop at Grant McCune Design and see this behemoth from across the room. 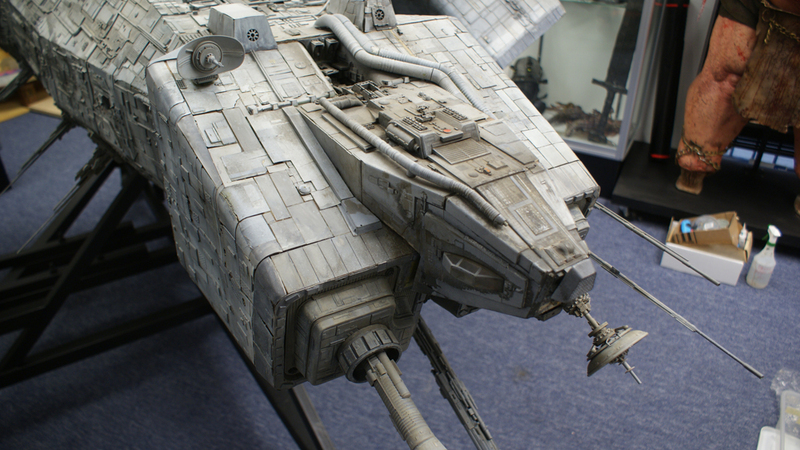 I remember stopping in mid conversation with Monty Shook and saying, “WOOO-AH THE NOSTROMO!!! 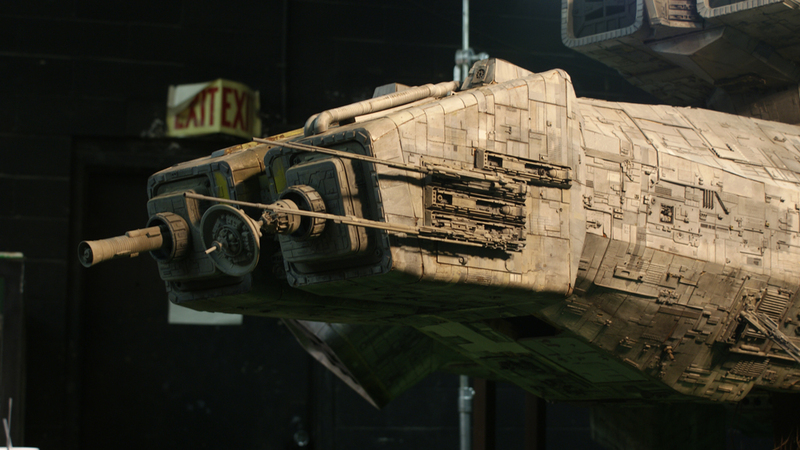 !” Monty said they were restoring it for a private party, and I couldn’t wait to get over and have a closer look. I was there working on another project that only lasted a day or so and never really got a chance but to see it from a far. Well, a few weeks later Monty called and asked if I wanted to come over and work on the ship for him…the rest of the crew were busy with other projects, and the model had to be completed so I was there the next day going over all that Monty, Jack, Olivia and Jason had done to get her to the stable and almost finished state that I first saw her in. The mini details were what were left, and we went through the photos to decide what needed to be done…the more we looked the more missing things there were. 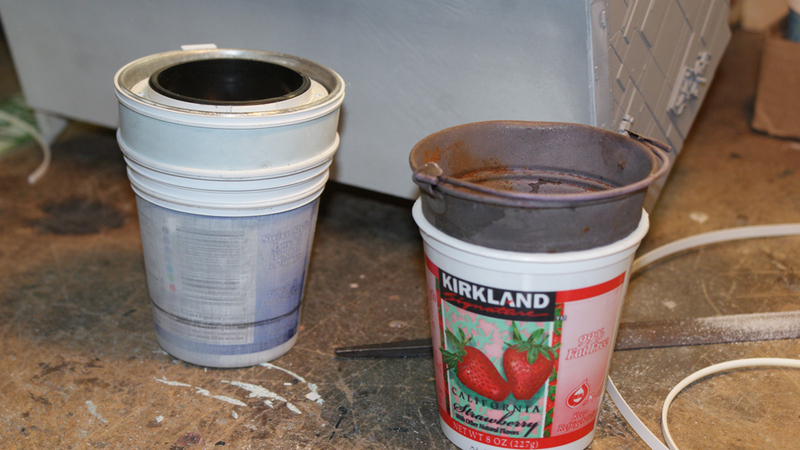 So, to start the project off, all the antenna arrays had to be rebuilt. None of the original pieces had made it back with the model, so all of them had to be created new from use of the photos provided. There were 10 arrays total, with the shortest being roughly six inches to the longest being 36 inches long. Grant’s model kits and brass rod collection had been depleted, and there was almost nothing to work with so a huge search throughout the shop’s drawers and boxes produced some parts from the old 70’s kits. New sets of brass had to be ordered and trying to find any of the kits used for the original were literally impossible or beyond expensive to acquire. On top of it all, the photos provided little help on what parts were used because the multiple laying of parts on parts on parts made the pieces indiscernible. With that said, the job of recreating the rods as close as possible to the originals came to be by matching the mass and diameters as seen from the photos and then translated out of the new material. The detail piece that the rods were attached to did survive, and Jack molded the master piece so a definite scale could be used for lengths and measures. 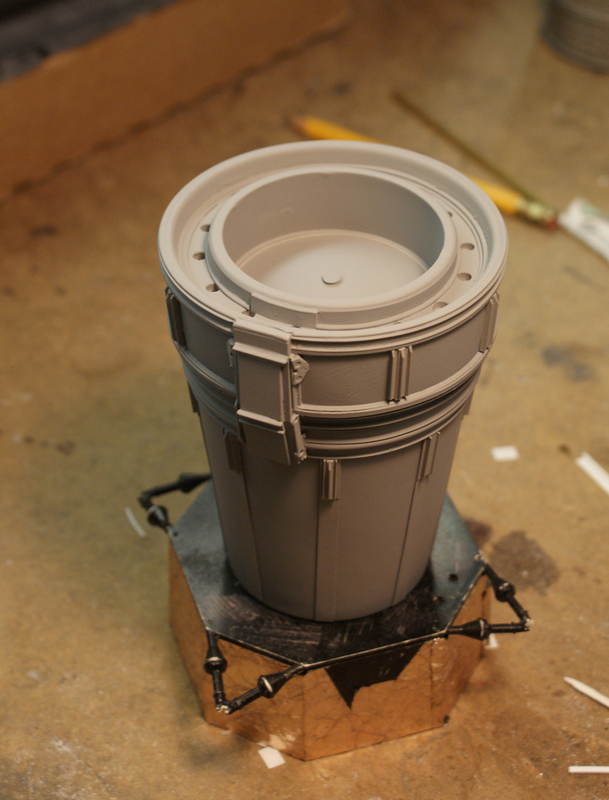 The piece itself is a spaced out little chassis from the bottom of a 1/24th scale truck cab. 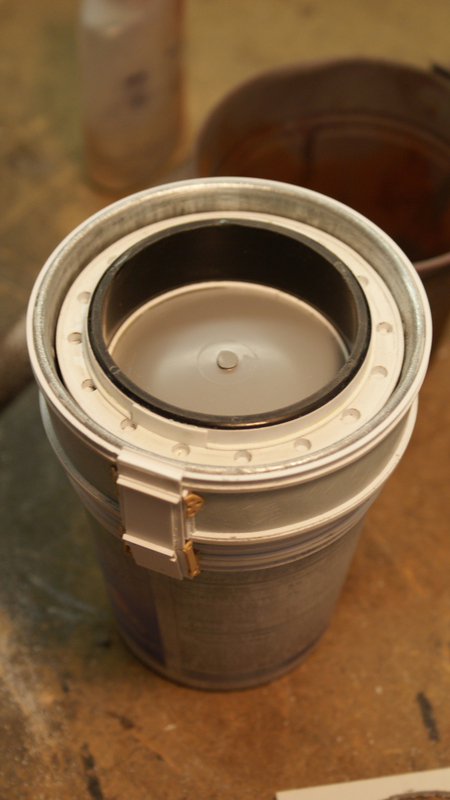 From there, multiple sizes of brass tubing were cut and assembled to create the under structure of the antenna’s the rods and were then mounted to the chassis base piece, and then the kit bashing and detailing began. 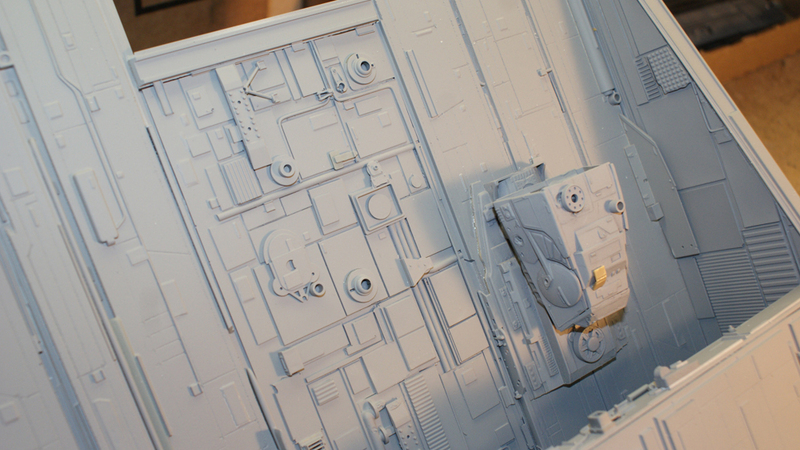 In these pictures you’ll see some of the finished miniature in England as it sets in the model shop, then there will be a couple of what the model looked like when Monty picked it up from KNB, followed by a shot of what it looked like before the micro detailing began. 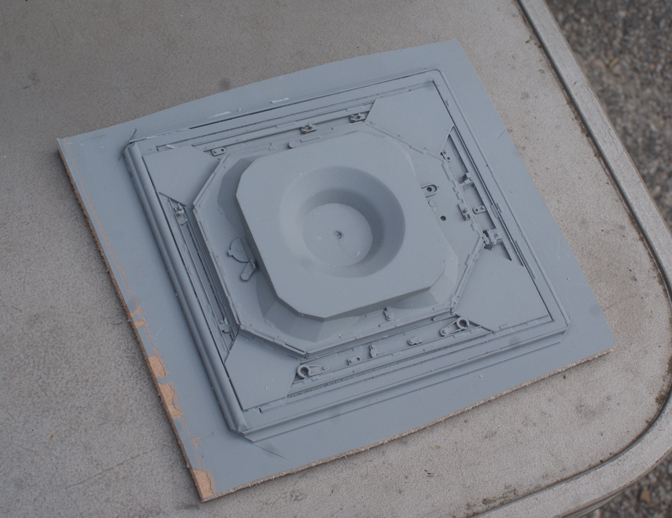 The final pictures will show the construction of the antennas and how they looked after being placed back on the model. 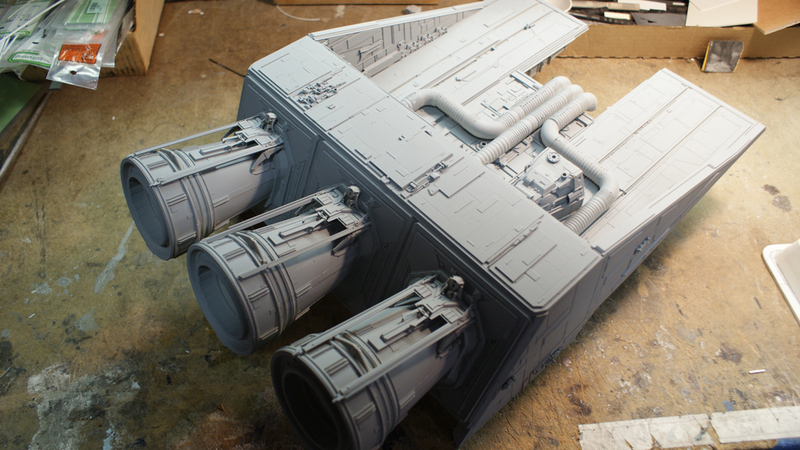 OK, enjoy and look forward to the next installment in the restoration of the great Nostromo!